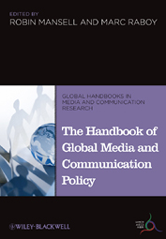 The Handbook of Global Media and Communication Policy offers insights into the boundaries of this field of study, assesses why it is important, who is affected, and with what political, economic, social and cultural consequences. Provides the most up to date and comprehensive collection of essays from top scholars in the field. Includes contributions from western and eastern Europe, North and Central America, Africa and Asia. Offers new conceptual frameworks and new methodologies for mapping the contours of emergent global media and communication policy. Draws on theory and empirical research to offer multiple perspectives on the local, national, regional and global forums in which policy debate occurs.